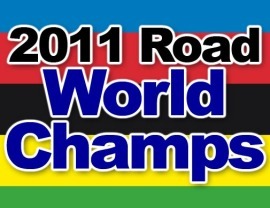 For the last two years I’ve been able to ride the World Championship circuit. Not this year, this year I walked it during this morning’s Junior Boys race. It’s only 13.5kms and I’m a very brisk walker. It’s not quite as good as cycling it, but it did give me a better perspective of the course, the profile of which is shown below. The important scale here is the vertical one. Hardly any real elevation at all. It’s undulating, but the inclines are really neither long nor steep enough to trouble anyone in the professional peloton. There’s all too few places to launch a successful attack. It’s not technical, despite a number of the younger riders coming to grief on some of the corners. There’s a lot of road furniture but it’s very visible, well padded and the riders will all know where it is from their reconnaissance rides. In yesterday’s U23 race, the feed-zone proved pivotal in launching some of the breakaways but this was made easier by the less than aggressive pace set by the bunch. This morning’s race demonstrated that it is possible to win from a breakaway but it was won by the team with the greatest number of riders who had been omnipresent throughout the race. The racing was aggressive from the start and dominated by a flurry of attacks with the successful break getting free only in the final laps of the race and managing to maintain it’s slender margin despite the advancing peloton. The winner, 18-year old Pierre Henri Lecuisinier, who raced clear in the final 150m, completed the 126km race at an average speed of 44km/hr and finished ahead of two of his breakaway companions, Belgium’s Martijn Degreve and Holland’s Steven Lammertink. France’s Florian Senechal, winner of this year’s junior Paris-Roubaix, finished 4th and 5th was Germany’s Rick Zabel, son of the great Erik Zabel who was supporting enthusiastically, along with Frau Zabel, from the sidelines. The sunny but chilly weather persisted for the 140km ladies Elite race where I resumed my place on the 50m line. Again, the winner came from the largest team. Clearly, size matters. ln women’s races there tends to be far fewer escapees instead it’s just pretty hectic racing. Like the race this morning, there was a bit of a pile up on the final lap ,where the peloton took back lone escapee Canada’s Clara Hughes (or Huge as she was called by the Danish commentator) on the run in to the line. The Dutch took charge, hoping to lead out Marianne Vos. But Italy’s Georgia Bronzini, the defending champion, powered her way past Vos in the final (yes, you’ve guessed it) 150m to win by a tyre width. It’s Groundhog Day. Cue lots of squealing Italians and glum faces for the Dutch as Vos recorded her 5th consecutive silver medal, after gold in 2006. Germany’s Ina Teutenberg was 3rd. Today’s score, all square Ute 1 – 1 Sheree. However, in a bunch sprint finish, it’s hard to look beyond Mark Cavandish who has a dream support crew. If, against the odds, it’s not a sprint finish then Phil Gil might find himself being challenged by Fabulous Fabian who has to be smarting after Wednesday’s loss. Yes, I know he won a bronze but, get real, it’s gold that counts!